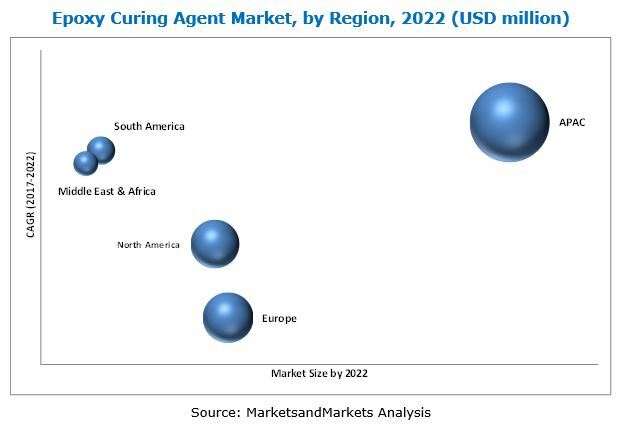 [162 Pages Report] The epoxy curing agent market is estimated at USD 3.61 billion in 2017 and is projected to reach USD 5.02 billion by 2022, at a CAGR of 6.84% during the forecast period. In this study, 2016 has been considered as the base year, and the forecast period is 2017-2022. The report aims at estimating the size and growth potential of the epoxy curing agent market across different segments, such as type, application, and region. 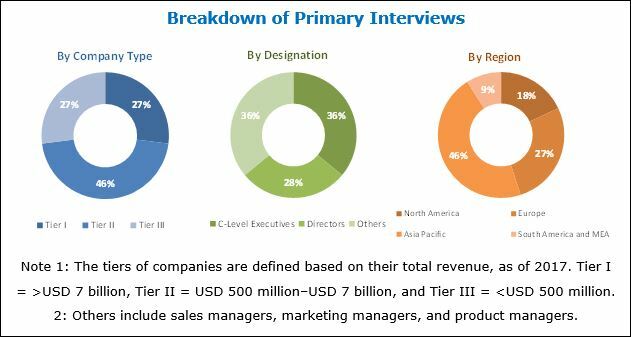 Factors such as drivers, restraints, opportunities, and challenges influencing the growth of the epoxy curing agent market have also been studied in this report. The report analyzes opportunities in the epoxy curing agent market for stakeholders and presents a competitive landscape of the market. Both, top-down and bottom-up approaches have been used to estimate and validate the market size of epoxy curing agent and to estimate the sizes of various other dependent submarkets. This research study involved extensive use of secondary sources, directories, and databases, such as D&B Hoovers, Bloomberg, Chemical Weekly, Factiva, and other government associations. Moreover, private websites and company websites have also been used to identify and collect information useful for this technical, market-oriented, and commercial study of the epoxy curing agent market. After arriving at the total market size, the overall market has been split into several segments and subsegments. The figure given below provides a breakdown of primaries conducted during the research study, based on company type, designation, and region. Evonik Industries (Germany), Hexion Inc. (US), Huntsman Corporation (US), Cardolite Corporation (US), BASF S.E. (Germany), Cardolite Corporation (US) are some of the key players operating in the epoxy curing agent market. This research report categorizes the epoxy curing agent market based on type, application, and region. The epoxy curing agent market is estimated at USD 3.61 billion in 2017 and is projected to reach USD 5.02 billion by 2022, at a CAGR of 6.84% from 2017 to 2022. The increasing use of epoxy curing agent in various applications, such as coatings, electrical & electronics, wind energy, construction, adhesive, and composite is driving the growth of the epoxy curing agent market. The epoxy curing agent market has been segmented on the basis of type, application, and region. Based on type, the epoxy curing agent market has been segmented into amine-based, anhydride, and others. The amine-based segment is expected to grow at the highest CAGR in terms of value. Amine-based curing agents are more durable and chemical resistant than other curing agents, including its advanced properties such as curing time, pot life, chemical & thermal resistant, and weather ability. These curing agents play a vital role in determining the properties of the final cured product. 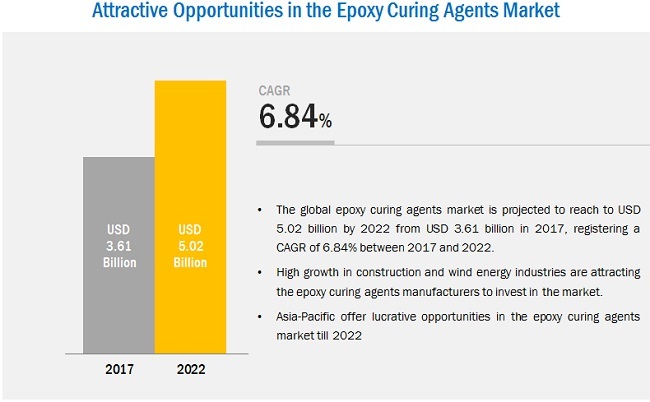 Based on application, the epoxy curing agent market has been segmented into coatings, electrical & electronics, wind energy, construction, adhesive, composite, and others. The wind energy segment is expected to grow at the highest CAGR, in terms of value, during the forecast period. Curing agents are preferred for epoxy resins for wind blade fabrications due to their high sheer, compressive strength, and light weight. The fatigue performance of epoxy curing agents improves the composite mechanical properties in rotor blades, thereby, enhancing the performance of wind turbine. These all are considered to be the forthcoming factors for epoxy curing agent into different applications. The epoxy curing agent market in the Asia Pacific region is expected to grow at the highest CAGR during the forecast period. APAC is a rapidly developing region with many emerging countries and application sectors. These hold much opportunity for industry players who are willing to invest in these areas. The rising demand for epoxy curing agent from the key applications are coating, electrical & electronics, wind energy, construction, adhesive, composite, and others from countries such as India, China, Japan and others is projected to drive the growth of the epoxy curing agent market in the region. Strict regulations from regulatory bodies restrain the manufacturing of curing agents for epoxy resins in European regions. With the increase in environmental concerns and regulatory policies, the manufacturers are adopting eco-friendly products in various applications. Furthermore, the global manufacturers of epoxy curing agents are focusing on ensuring safety and avoid health hazards due to the VOCs emission from chemical products. Key players operating in the epoxy curing agent market include Evonik Industries (Germany), Hexion Inc. (US), Huntsman Corporation (US), Cardolite Corporation (US), BASF S.E. (Germany), Cardolite Corporation (US). 14.2 Air Products and Chemicals, Inc.
14.7 Kukdo Chemical Co., Ltd.
14.8 Aditya Birla Chemicals (Thailand) Ltd.